Has Bezos Really Found the Apollo 11 Engines? In this July 16, 1969, file photo provided by NASA, the Saturn V rocket that launched Neil Armstrong, Buzz Aldrin and Michael Collins on their Apollo 11 moon mission lifts off at Cape Kennedy, Fla.
"If you like Apollo 11, you might enjoy Apollos 12, 13 and 14 too!" O.K., so the jokes make themselves, but they were unavoidable after Amazon.com chief Jeff Bezos announced on Wednesday, March 28, that a team funded by his eponymous Bezos Expeditions had found the F-1 engines that powered the first stage of the Apollo 11 booster when it left its pad nearly 43 years ago en route to humanity's first moon landing. The F-1s, which were the true muscle of the massive 363-ft. (110 m) Saturn V rocket, were extraordinary pieces of engineering. Five of them, generating 1.5 million lb. (680,000 kg) of thrust each, were clustered at the bottom of the booster, and collectively they torched through more than 6,000 lb. (2,700 kg) of fuel every second. For all that power, they lived for only about 165 seconds, after which the first stage was jettisoned and sent tumbling into the Atlantic, where it would sink beneath the waves forever. Maybe not forever. The Atlantic floor is littered with NASA artifacts, and in 1999 an expedition funded by the Discovery Channel recovered the Mercury spacecraft, dubbed Liberty Bell, that carried Gus Grissom aloft on his suborbital flight in 1961. All of the Mercurys were intended to be hoisted aboard the deck of a recovery ship when they splashed down, but Grissom's craft famously sank when the hatch blew prematurely, and it remained a lost prize for treasure hunters for nearly four decades. The F-1s are a much bigger target than the phone-booth-size Mercury, but nothing resting beneath 14,000 ft. (4,300 m) of ocean is easy to find. Bezos' team conducted its hunt with state-of-the-art sonar, and its success at spotting the engines is a real coup. Still, it leaves a number of questions unanswered  not the least being whether those engines really did come from Apollo 11. NASA launched 13 Saturn Vs from 1967 to 1973, and all of them flew an eastward trajectory over the Atlantic. The spacecraft's ultimate destination determines what its azimuth  or angle of inclination  will be at launch, and it makes a difference not only whether the ship was headed for Earth orbit or the moon but also precisely where on the surface of (or around) the moon it was going. Thus, Apollo 8's launch azimuth was 72.124 degrees, Apollo 10's was 72.028, Apollo 11's was 72.058, and so on. 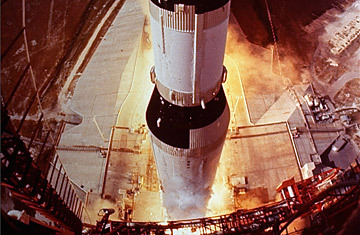 Those fine shavings of a degree make a big difference in determining whether a craft is to wind up on the Sea of Tranquility or the Fra Mauro Highlands, but they can be wiped out completely when a Saturn V's engines are on a chaotic tumble from an altitude of 42 miles (68 km), and most of the first-stage hardware could have thus wound up within pretty much the same Atlantic footprint. Only the first stages of Apollo 15, with its launch azimuth of 80.088 degrees, and Apollo 17, with its even more sharply angled 91.503, would likely have landed in a part of the ocean significantly different from the others. "We haven't seen [Bezos's] data yet, so we're not in a position to be able to confirm whether what he found is Apollo 11," says NASA spokesman Bob Jacobs. "The administrator did receive a letter from Bezos today detailing the discovery, however." Regardless of the specific identity of the F-1s, there's reason for concern about their condition. Four-plus decades of immersion in salt water is not good for any kind of metal; consider the state of the Titanic, which was found 73 years after it sank. Still, ship metals and rocket metals are very different, and as Bezos aptly points out on his website, the engines are "made of tough stuff, so we'll see." The bigger question is whose stuff they'll be. Salvage issues are some of the trickiest areas of maritime law, but the U.S. government, with warships, merchant vessels and space assets resting on ocean floors all over the world, is well versed in it. "The rules regarding NASA property in the ocean are the same as for sunken treasures or ships out at sea," says Lisa Malone of the Kennedy Space Center. "We would retain the ownership until the property is properly disposed of." In the case of space hardware, "until the property is properly disposed of" means both when the matter of legal title can make its way through formal channels and when any hazardous materials can be safely removed. The materials removal is a fairly straightforward job; for that matter, so is the question of title. NASA has always been generous with its artifacts  witness how many of them are the property of museums in the U.S. and other countries. The Liberty Bell now belongs to the Kansas Cosmosphere in Hutchinson, Kans., and the retired space shuttles are all being shipped off for display in various museums around the U.S. In the case of the just-found F-1s, says Jacobs, "there are ways that transfer of ownership of federal property can be made. We don't see ownership being any impediment." That will be a very good thing both for NASA and for an American public that is too easily forgetting the scale of the space agency's achievements in the middle of the past century. If seeing the F-1s inspires more such explorations in this century, then the Apollo engines will have done their job not once but twice.